Wind up wire to take down a fence or unwind wire to install a new fence line--either way, the Ranch Hand is designed for operator ease and comfort! 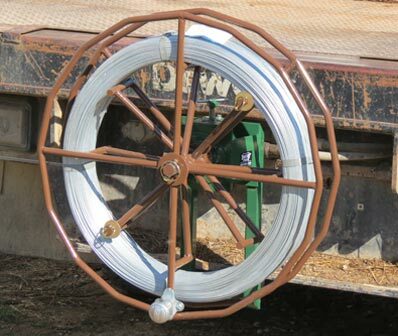 The Ranch Hand Wire Reel installs easily and quickly into an existing receiver hitch on most 4-wheel vehicles, and mounting adaptors are also available for bale beds, flat beds, loader buckets and for working on the ground. Position the Ranch Hand Reel in the vertical position for winding wire up. Position the Ranch Hand Reel in the horizontal position for unwinding wire. 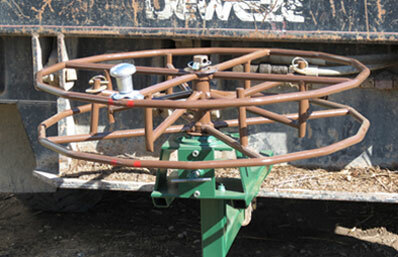 The Ranch Hand will roll up to 1 mile of fence wire using 12-1/2 gauge smooth high-tensile wire. Once wound, bundles of fence wire can be labeled and removed from the reel to help you keep your supplies organized. 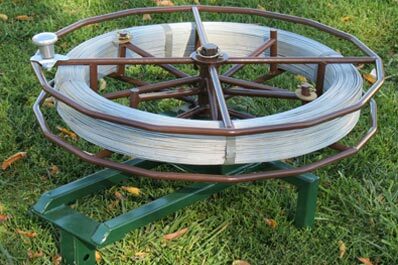 PLUS - the labor saved by using the MSF Ranch Hand Wire Reel will more than pay for your investment!